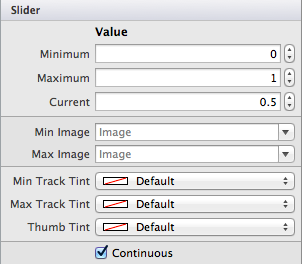 The slider control allows for simple selection of a numeric value within a range. The control defaults to a value between 0 and 1 but these limits can be customized. You can use any image, as it will be overridden, but make sure it is placed in the Resources directory and is called in your code. iOS uses the UISwitch as a boolean input that may be represented by a radio-button on other platforms. The user can manipulate the control by moving the thumb between the On/Off positions. 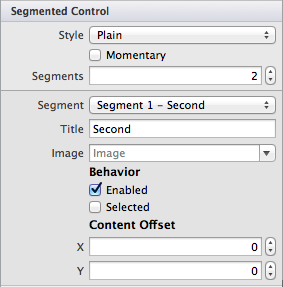 It should be noted that the Segmented Control Style has been deprecated in iOS7, and therefore, adjusting options for this in an iOS7 application will have no effect.